Screen Printed in One Color on a Colored 16oz Stadium Cup. Available in increments of 12 or more. Price Includes Printing on 1 Location. 2nd Location at Higher Cost. 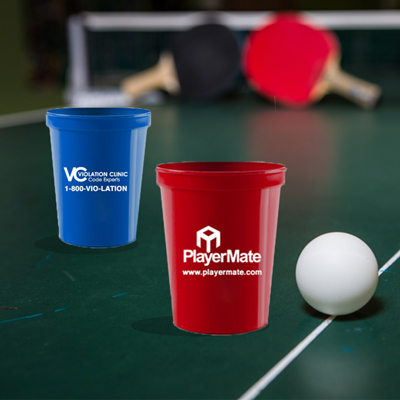 14 Color Stadium Cups to choose from. Do not put imprinted plastic cups or bottles in the dishwasher. Hand wash only with mild, liquid detergent soap. Avoid the use of commercial detergents or abrasive cleansers which will damage the imprint and scratch surface. Stadium Cups 16oz: Cheers to your new custom Stadium Cups—one of the most fun and practical advertising or team spirit products we’ve got! When they raise their cup, your message will be right there in the heart of leisure time—the best place to be to have a lasting positive impact. Your 16oz Stadium Cups will be screen printed in white on your desired color cup. With 14 cup colors to choose from, you can customize your Stadium Cups to suit your brand or team. Our Stadium Cups come with a white ink imprint size of 3x3. Price includes printing on 1 side, but you can choose to add the second side for an additional fee. 16oz Stadium Cups are available in quantities of 12 or more and are not dishwasher safe. Select the color of Ink required for your coolie. 1/0 = One Color 1 Sided. 1/1 = One Color 2 Sided.